For old time’s sake, I just have to walk towards the Tesco and have a quick espresso at the little stand. The owners are momentarily surprised to see me again, but nonetheless serve me up a thimbleful of the potent brew. 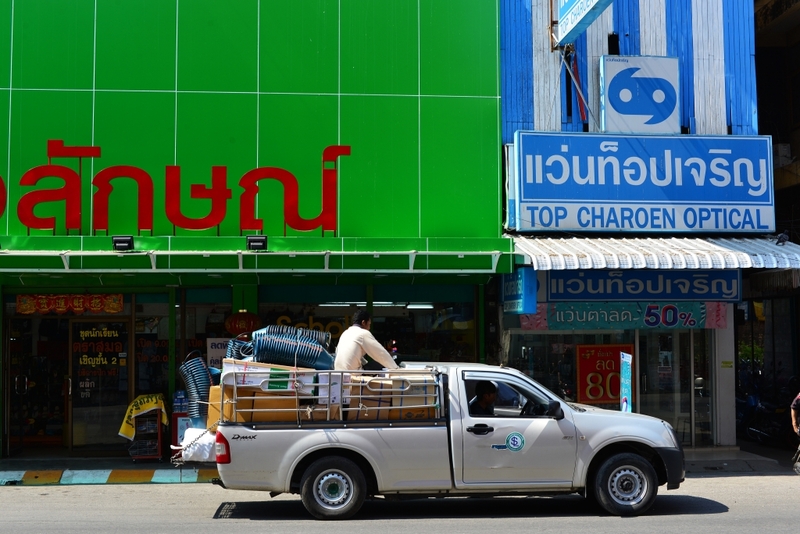 The blue songthaew is not long to arrive; riding off to the south, I watch the scenery slide by, the urban sprawl gradually eviscerating, and beyond the odd assortment of establishments, the green countryside emerging along the two-lane road. Eventually the urban development becomes denser, and it seems as if we are approaching Lamphun. The songthaew halts in front of a temple even far larger than the ones we had passed previously. As one of the passengers disembarks, I look quizzically at the remaining women seated across from me. 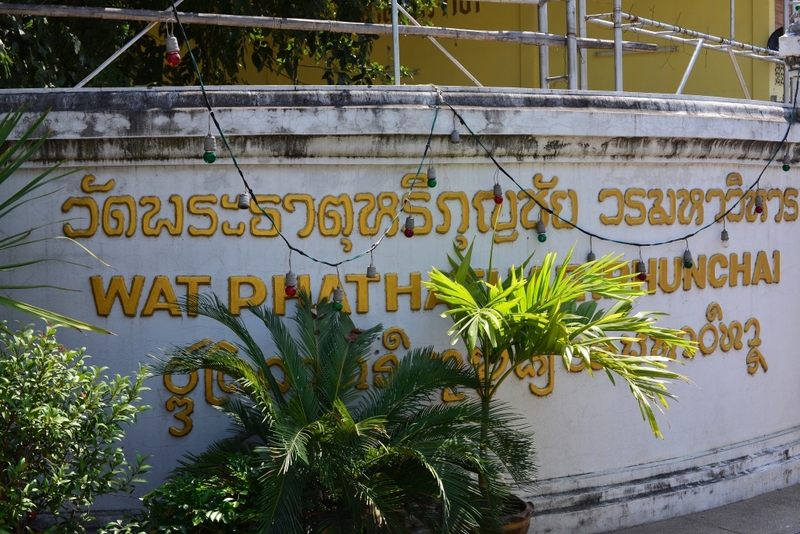 ‘Lamphun?’ I ask. They nod in affirmation, and as I disembark, I see two two young Caucasian men descend from their motorcycles and enter the temple grounds. I follow them in, and demand to know whether this temple is it in town. Well, they are not really sure, but it would seem we are somewhere around the town centre. Stupid questions to the two Philadelphians aside, it turns out that we are in the dead centre of town, and in fact at its most storied temple, Wat Prathat Haripunchai Maha Viharn. 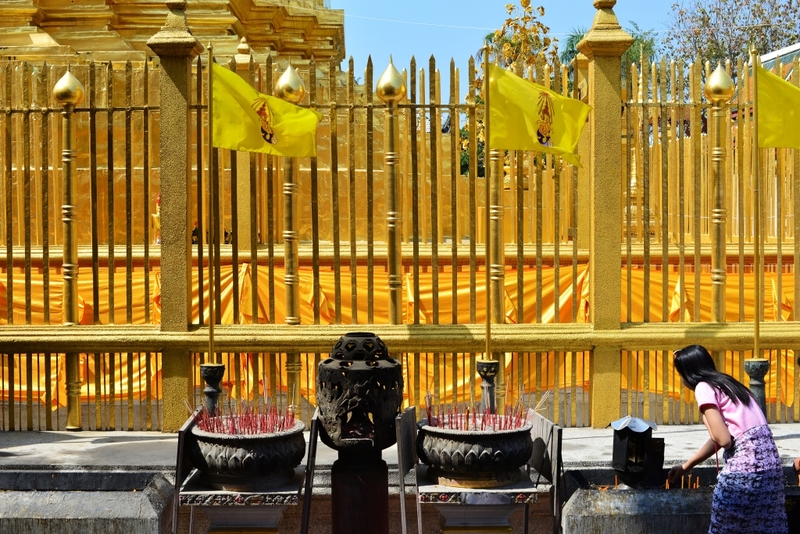 The temple was originally founded some 900 years ago, long before the kingdom of Chiang Mai even existed. It covers extensive grounds, and includes several of the standard viharas, a golden stupa encircled by a fence, and a library. Visitors must take their shoes off around the golden chedi, which reminds me of having to do the same in India, except that the pavement in India would be searing hot. The temperatures in Thailand are fortunately not that high yet! 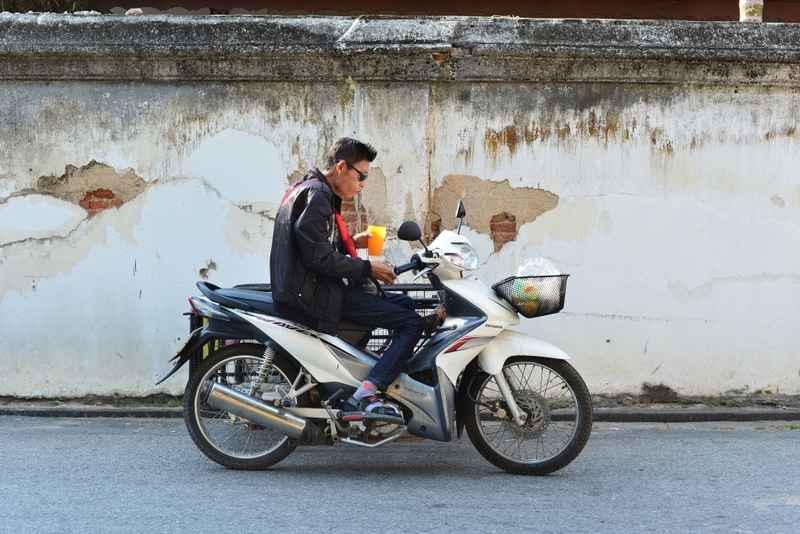 Wandering along the short blocks of Lamphun, there is very little traffic, and in fact many of the vehicles only songthaews. The occasional colourful facade appears amidst the arid streetscape, some large colonial-style structures facing expansive lawns municipal buildings. The humble retail and residential buildings occupy no more than several stories. 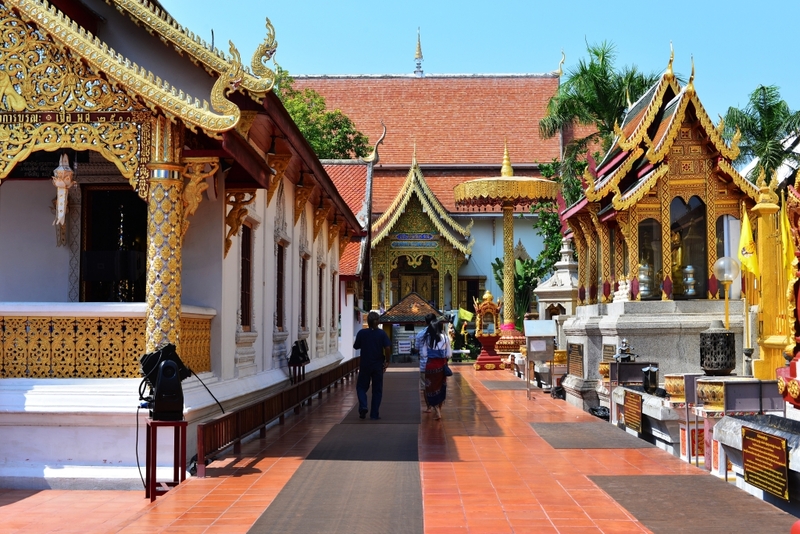 The town feels tranquil and somehow bucolic, radiating a sense of beauty that Chiang Mai is just too busy and self-involved for. Another marked difference is that people seem attentive and very polite, evoking a sense of reaching out. 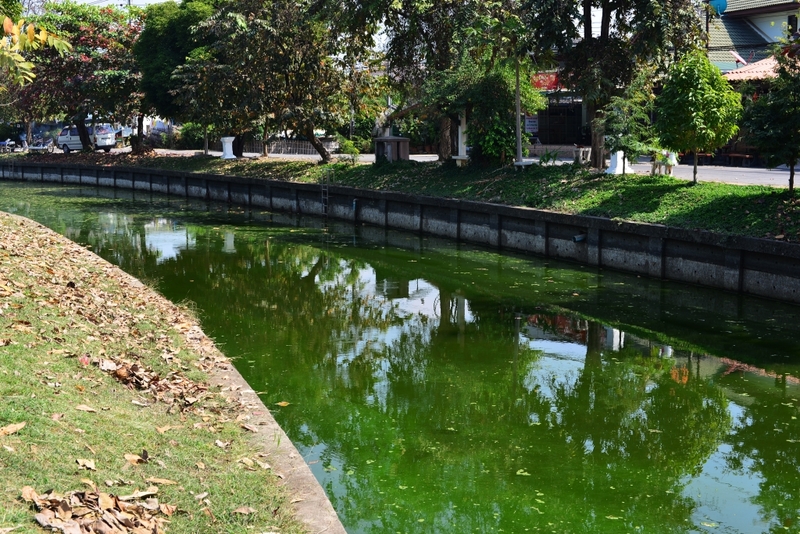 The hot sun beats down on Lamphun as I ascend several blocks beyond the municipal hall towards the periphery of the town, the boundary of the elliptically-shaped inner town bounded by a moat. 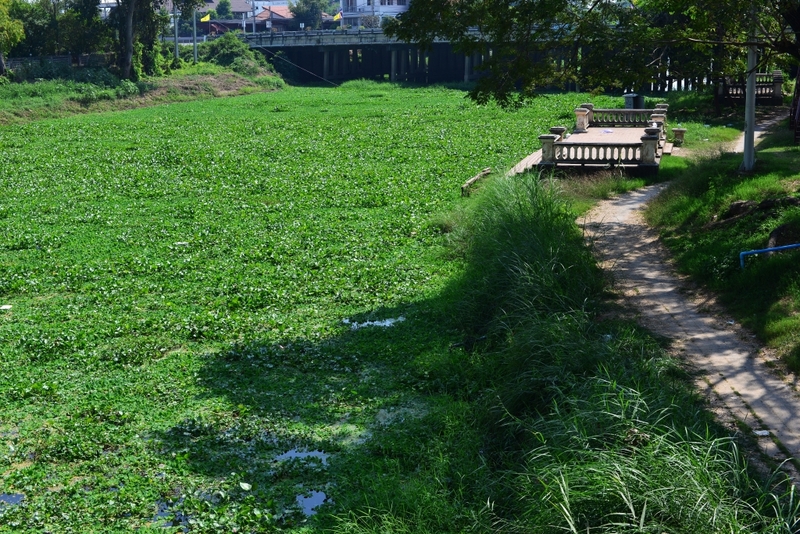 Its grassy banks descend towards the turgid green water, in some patches men seated inexplicably at the edge with fishing rods. 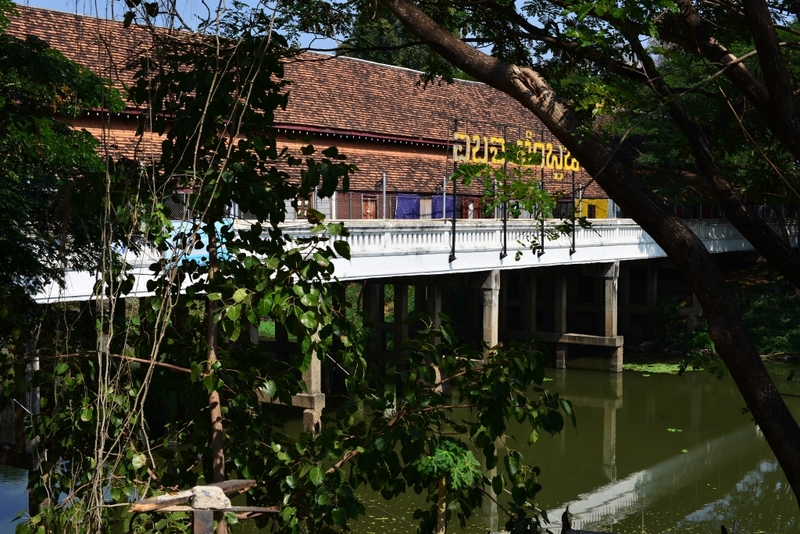 To one side, the road spanning the canal joins a wide boulevard emanating eastward over a wider river, and through the thicket of trees, a covered narrow wooden bridge spans the river, both sides of the interior dedicated to quaint stalls selling dried fruit, snacks, trinkets, cotton and silk fabrics, clothing, bags, and so on, intended to lure money from the pocketbooks of the tourists who are barely visible. As drenched in foreigners as Chiang Mai may be, the only foreigners I see in Lamphun are the two Americans and a young female walking by on the street. As enticing as the market stalls and adjacent utterly empty cafes may be, I should keep on walking, ever cognizant of the need to not miss the last songthaew back to Chiang Mai. 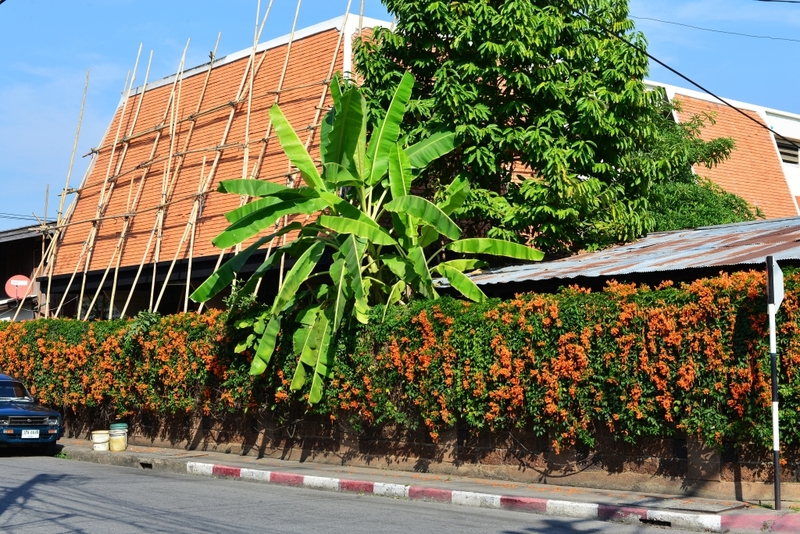 Small flowering green plots bring colour to the town as do the ubiquitous orange trumpet flower vines found through the region, the cascading flowers offsetting the drab concrete and carpet of foliage. 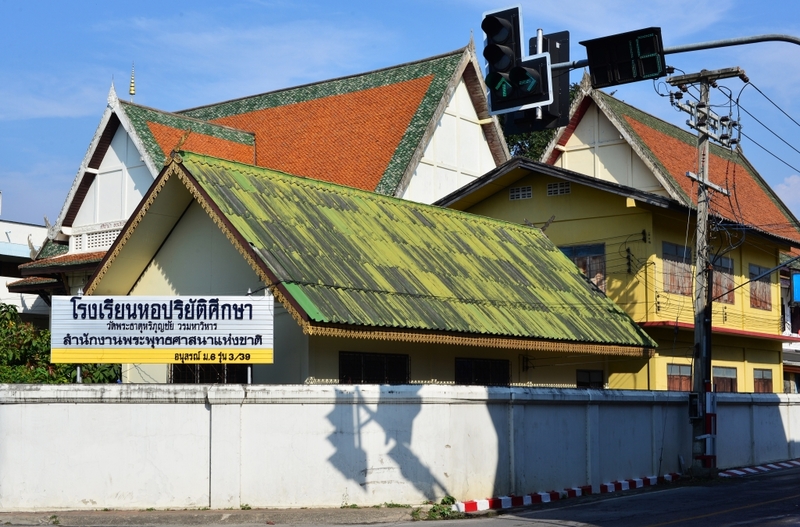 The museum is that last stop on my brief whistle stop to Lamphun, a modest affair placed immediately across from Wat Prathat Haripunchai Maha Viharn. On one hand, charging the same admission for the paltry displays of local history as major collections in the country (100 baht) seems a bit disproportionate, but then I have the time and inclination, which is not always the case. 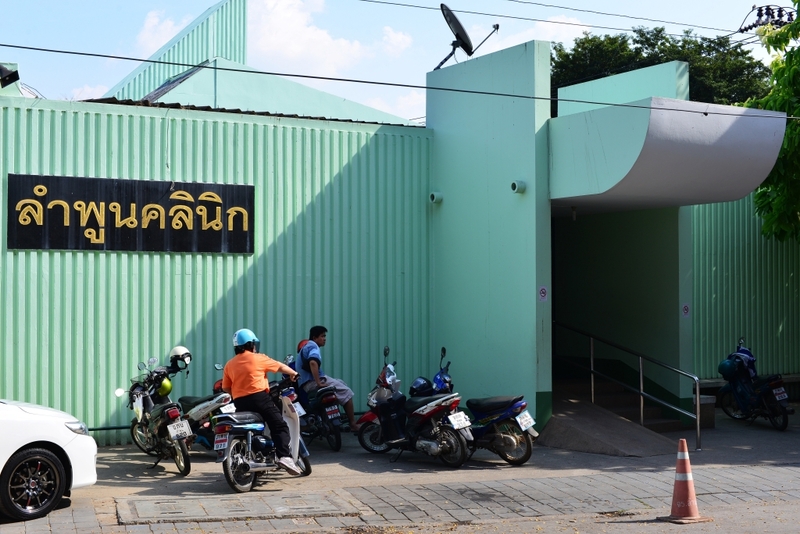 The collection occupies several halls, and includes religious and domestic ceramic and stone ornamentation spanning the centuries since Lamphun’s rise to importance, long predating the relatively recent ascendancy of Chiang Mai. 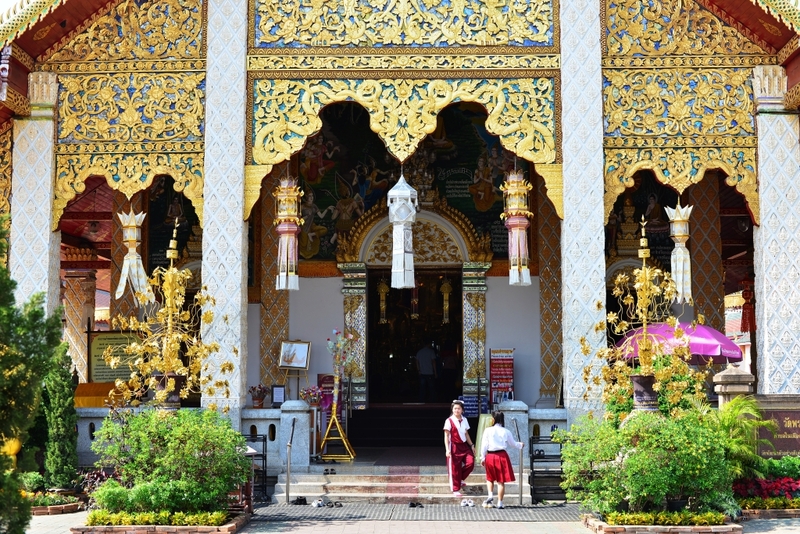 Lamphun originated as Hariphunchai in 660, the capital of the Mon kingdom, but by 1283 was incorporated into King Mengrai’s territories, which were later consolidated into Chiang Mai. Perennially confusing (for the farang, anyway) in Thai museum displays is the use of Thai Buddhist calendar dates as opposed to the Gregorian convention used in western countries. 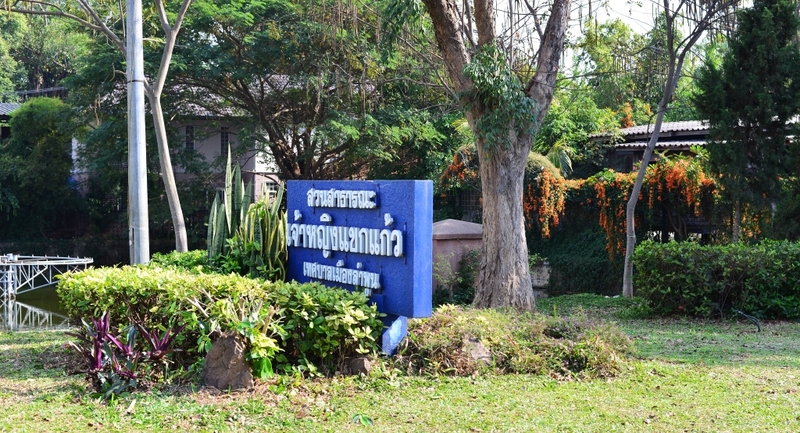 The museum is very simple in contents, nonetheless providing an encapsulation of early Lanna culture. 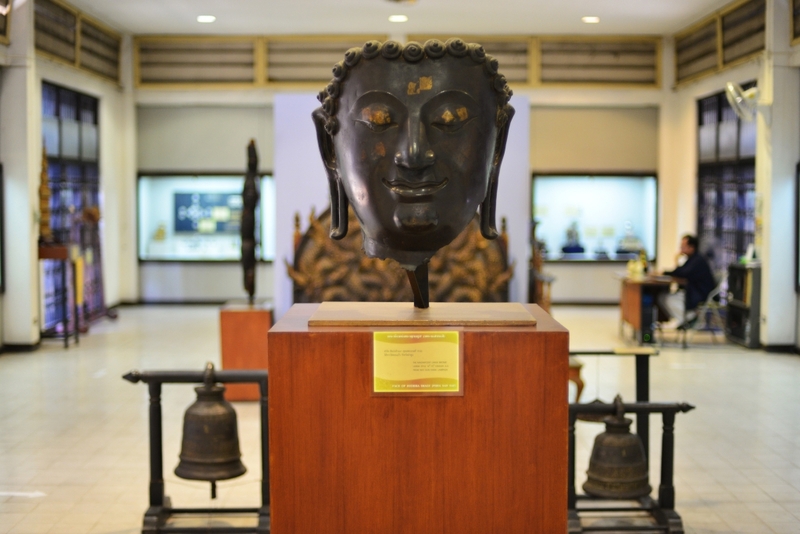 Some of the Buddha busts and temple ornaments are in fact of a quite spectacular quality. 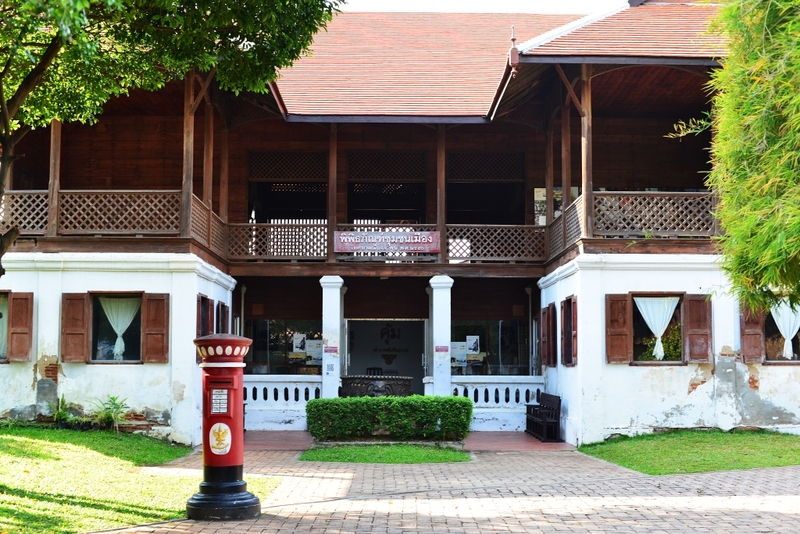 The museum expands on the architectural concepts specific to the Lanna culture found in the folk life museum in Chiang Mai, the exhibits concentrating on weapons, lacquer and pottery. Much of the embellishment in textiles, privileged utensils and weapons, and domestic and religious architecture is hardly unique, largely common with that found throughout Southeast Asia, certainly in the Malay and Indonesian region. Regarding the cross-pieces typical of northern Thai houses, the kalae is thought to be a construction emanating from rooftops near the ridge of simple huts where the beams of the roof cross. Eave brackets are typical of more elaborate structures in the region, often in the shape of floral or mythological creatures, typically assuming the form of the naga-tan or ‘punished naga’. Lanna houses also feature heavily carved lintels placed above the doorway leading from the verandah. The hamyan was intended to protect the family from harm, be it from other humans or evil spirits. Furthermore, it was intended to protect the virility of the inhabitants, the whorls in the symmetrical floral patterns representing testicles. The length of the hamyan was to be three to four times the size of the house owner’s feet, and walking under the hamyan also signified abasement to the master of the home. When a home was sold to another owner, the lintel had to be destroyed, as it reflected the accumulation of power of the departing owner. The beaming young woman at the museum reception turns off the television I approach her counter, motioning me to walk down the street and around the corner to a decent eatery. The side streets present an even more tranquil side of Lamphun, the retro-style fire hall, gracious wooden bungalows draped in orange trumpet flowers and old mansions, tiny and impeccably-maintained restaurants, a far cry from the slovenly grime I am used to seeing street-side in the larger towns and cities. The few selections I try at the Par-Si restaurant are quite good, seated at the front behind the screen of tall potted plants. The elderly owners of the restaurant are intent on seating me in the shade, but no, I do in fact want to sit in the sun! An aging dog crawls to the side of the road from the stand selling roast meat, the younger vendor alternating between calls on her bright pink mobile phone and negotiating with a second woman in a brilliant yellow outfit and fake Chanel sunglasses, who carefully inspects every piece of her merchandise. 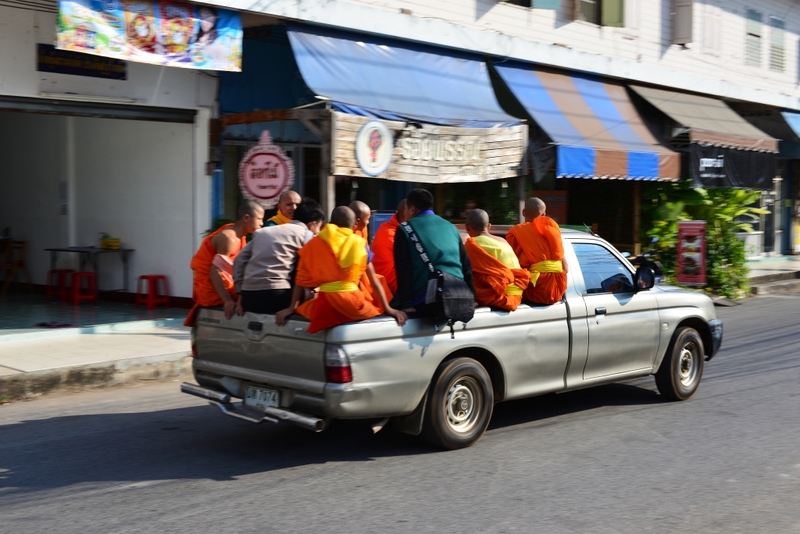 One of the ongoing stream of blue songthaews stops for me, then putters off as I hang from the back with a handful of miniature Thai soldiers, politely making way for the passengers climbing onboard and disembarking, noxious smoke billowing from the exhaust pipe below us. The town sprawls quite a ways north of the boundaries of the moat, but beyond a few temples and cafes I am not sure what the reason for spending time on the ground here would be. Hanging from the back of the songthaew, I take in a completely different view of the countryside passing by en route to the junction with the 1141 running west to the airport. 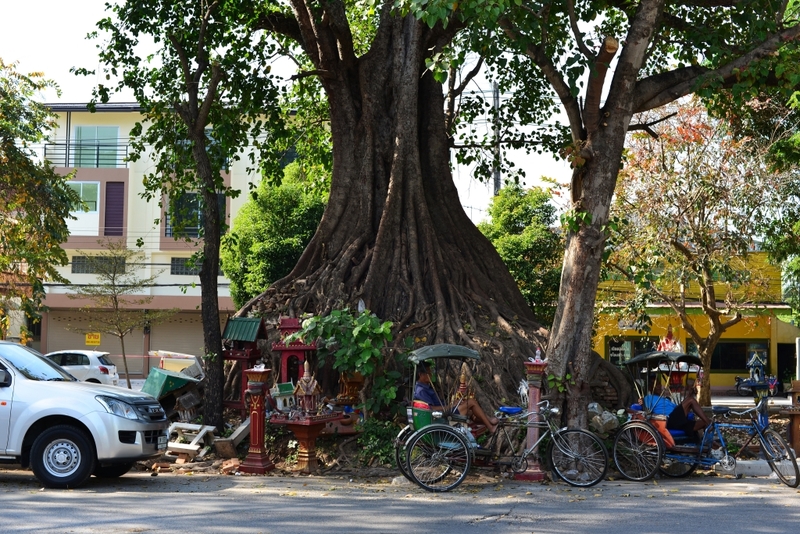 We are surrounded by countryside, workshops, small warehouses, retail outlets, and tiny plazas and cafes, although the remarkable thing is that the weaving country road is flanked by towering Dipterocarpus trees that create an immensely dramatic backdrop. My head remains tilted upwards towards these majestic giants the entire journey back to the Adventure hotel on the outskirts of Chiang Mai.